AIATSL Recruitment 2019 - Walk in for 205 Customer Agent, Duty Manager & Other Posts in AIATSL, Mumbai, Maharashtra on Contract Basis. Candidates are invited by AIATSL - Air India Air Transport Services Limited to attend walk-in-interview to be held on 24 Apr 2019 to 07 May 2019 for 205 vacancies. Pay the Examination Fee through Demand Draft in favour of “AIR INDIA AIR TRANSPORT SERVICES LTD.”, payable at Mumbai. 02 Graduate from a recognised university under 10+2+3 pattern with 18 years experience, out of which at least 06 years must be in a managerial or supervisory capacity in Pax and cargo handling functions with an Airline or Airport Operator or BCAS approved Ground Handler appointed by any Airport Operator at any airport or in combination thereof. 10 Graduate from a recognised university under 10+2+3 pattern with 16 years experience , out of which at least 04 years must be in a managerial or supervisory capacity in Pax and cargo handling functions with an Airline or Airport Operator or BCAS approved Ground Handler appointed by any Airport Operator at any airport or in combination thereof. ITI with NCTVT (Total 3 years) in motor vehicle / Auto Electrical / Air Conditioning / Di eselMechanaic / Bench fitter / Welder , (ITI with NCTVT - certificate issued from Directorate of Vocational education and training of any State /Central Government with one year experience in case of welder ) after passing SSC / Equivalent examination with Hindi / English / local language , as one of the subject. Eligible candidates may appear for interview along with duly filled application form in prescribed format (attached below) and self-attested copies supporting documents and original documents for verification. Air India Recruitment 2019 - Walk in for 79 Trainee Controllers & DEO Posts in Air India, New Delhi, Mumbai on Contract Basis. Candidates are invited by Air India Limited to attend walk-in-interview to be held on 30 Apr 2019 & 02 May 2019 for 79 vacancies. Air India Recruitment 2019 - Walk in for 70 Sr. Trainee Flight Dispatcher Posts in Air India, Delhi, Mumbai on Contract Basis. Candidates are invited by Air India Limited to attend walk-in-selection to be held on 06 & 09 May 2019 for 70 vacancies. 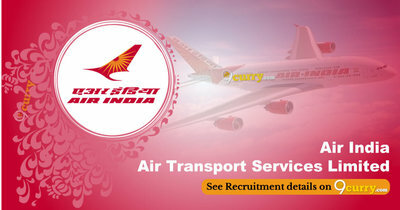 Air India Recruitment 2019 - Walk in for 61 Accounts Executive & Accounts Clerk Posts in Air India, Kolkata, West Bengal, Mumbai, Maharashtra, Chennai, Telangana, Bangalore, Karnataka, Hyderabad on Contract Basis. Candidates are invited by Air India Limited to attend walk-in-interview to be held on 03, 04, 10 & 11 May 2019 for 61 vacancies. AIATSL Recruitment 2019 - Walk in for Officer & Jr. Executive Posts in AIATSL, Delhi on Contract Basis. Candidates are invited by AIATSL - Air India Air Transport Services Limited to attend walk-in-interview to be held on 04 May 2019 for 8 vacancies.